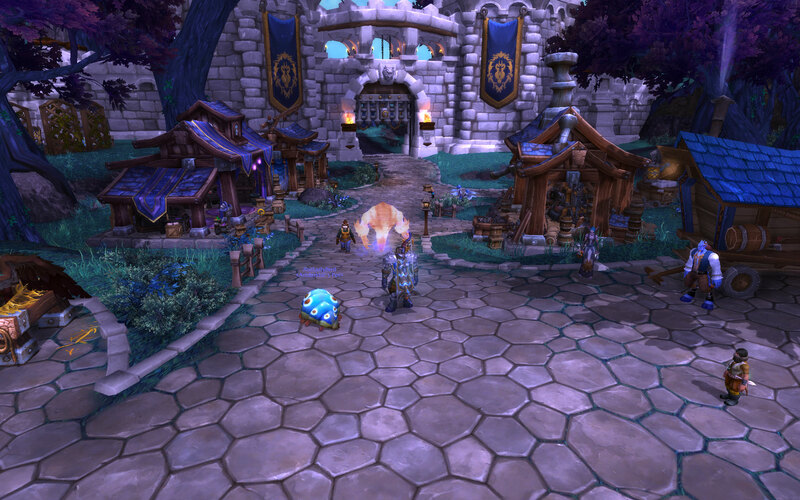 I've spent way too much time in the World of Warcraft beta for the Warlords of Draenor expansion, and after leveling three toons to 100 and another to 96, the thing that has kept me most intrigued is my garrison. Garrisons are a new addition in this expansion. The plot point is that this is your base of operations now that you have come 35 years back in time through the Dark Portal to stop renegade Mists of Pandaria bad guy Garrosh Hellscream in this parallel timeline. 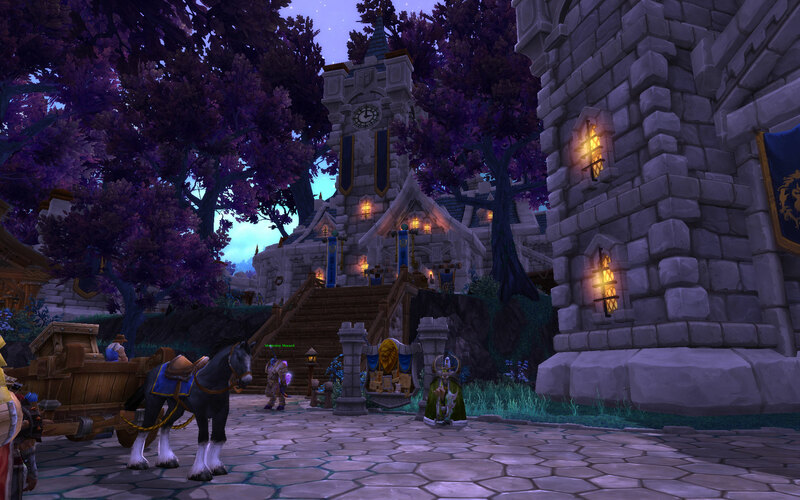 On Draenor (an un-imploded Outlands from The Burning Crusade expansion), you are commander of your garrison and make all the decisions on who to recruit, what to build and what missions to go on. Recruiting followers, building your base, gathering resources, running missions ... it has been an enjoyable side experience to dungeons and raids and the grind of leveling. And then I realized why I was enjoying it so much. I have loved RTS games as much as I love my WoW. The garrisons are configured in much the same way as Warcraft 3 or other RTS games for that matter: build your base, expand to the next level of technology, manage resources and gather hero units that increase in level to get you more goodies. Blizzard mixed its RTS into my MMO. After the initial intro quests that set the stage for your foray into Draenor to stop the Iron Horde, you are allowed to build a Tier 1 base. Your town hall -- its really more like a guard shack -- is the hub, and your first required structure is a barracks. Standard fare for RTS base building. In addition, you have one small "plot" where you can build another structure, usually reserved for one of your profession buildings, such as a blacksmith or tailor shop. Also included in your base are four mandatory structures that can eventually be upgraded: a mine, an herb garden, and fishing shack to aid in the pesky and occasional tediousness of the basic professions, and a menagerie for those into pet battles. As you level your character and complete various zones, you will get blueprints that will allow you to unlock new Tier 1 structures, or upgrade buildings to Tier 2. 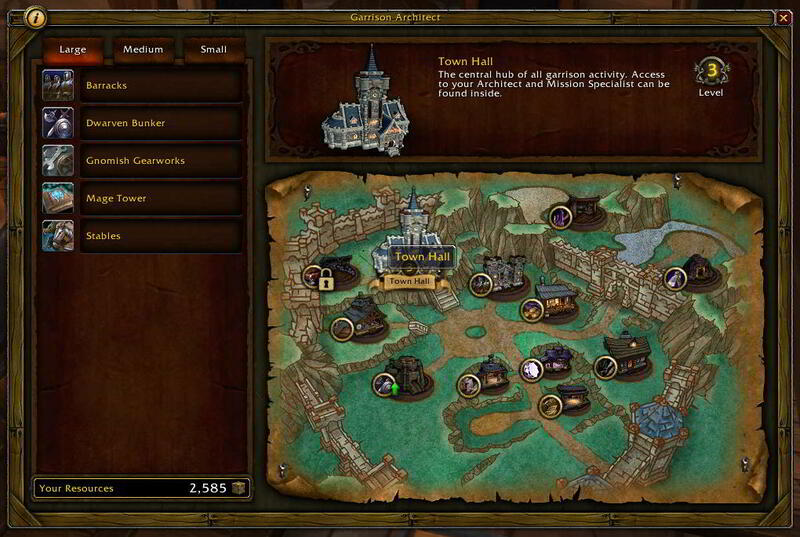 Halfway through the first zone, and around the time your character hits 92, you will be able to upgrade your Town Hall and base to Tier 2, giving you more plots to building a medium building and another small profession building. By level 96, you have unlocked some new blueprints for Tier 2 upgrades, and level 98 yields even more options. By level 100, you will be able to upgrade your garrison to Tier 3, giving you another large plot, another medium plot and one more small plot. So, aside from a limited number of plots in a confined space, base-building is straight out of the RTS playbook. The only thing missing is base defenses, which really aren't needed unless you choose to do "invasion" quests, and then guards and followers will automatically help you dispatch your foes with nary command from you, sadly. And there won't be a race to build your base as quickly as possible without power-leveling your character to 100 at the same time.